Series looking at the value of household junk. Jacqui Ormonde-Butler from the Sussex coast, attempts to raise cash for their boat which is in dire need of repair. Browse content similar to Ormonde-Butler. Check below for episodes and series from the same categories and more! Well, today I'm in East Sussex at this stunning location, Bodiam Castle. as a defence against French invasion and a comfortable home. and was intended to be a personal statement of wealth and power. of the interior left to give an impression of castle life. From the top of the towers are wonderful views of the surrounding Rother Valley. when they go under the hammer at auction. Coming up on today's Cash In The Attic, our expert has some royal aspirations. You won't be getting a loo, you'll be getting a throne. But he's looking for a helping hand with a valuation. I'm going to turn the tables on you. And our family are lost for words at auction. That is amazing. Are you all right? Let's hope they'll be shouting for joy when the final hammer falls. This historic house in the heart of the Sussex town of Battle is home to hospital nurse Jackie Butler. When Jackie inherited the house from her parents, she also inherited all the contents. And coming from a family with generations of collectors, that adds up to a lot of stuff. so it's time to tackle those family treasures. Just been to the castle, yes? Yes, what a beautiful castle. Has no interior, which is a bit of a shame. But anyway, there you go. Fantastic place to go. I'm sure there's lots inside. Yes, there is a lot to get through and this couple have got some really unusual interests. I'll find out more if you have a good look at the stuff, yeah? Get my hands dirty. OK. Morning. Wow, this looks like quite a strenuous job, I must say. But I guess we've got a strenuous job ahead of us, cos you've called us in. Yes. So what do you want us to do? We want to raise money to do some work on Simon's boat. Oh, what sort of boat have you got? I've got a 30ft sailing boat that I keep in Eastbourne, which is about 20 miles away. And...a bit of repair wanted. It got damaged. Seen better days. Yeah, so... Last year and we've got to do some repairs. So what sort of repairs are we talking about? Well, it's the head. The toilet area. It's sort of cosmetic as much as anything. So it's the lining. It's all sort of hanging down and it needs quite a bit doing there I think, so... Yeah. So how much money are we looking to raise? ?1,000 and a little bit more if we can. It depends. ?1,000 is what we estimate. So where are the items from, Jackie? I've inherited them from my grandparents and my parents. OK, all right. So you're quite happy for them to go now? of them anyway, and it's just a way of making some money out of them. And I know they'd want them to go to a good use, anyway. OK, so I take it you're going to enjoy the boat as well then? Yes, I do. I enjoy it anyway, yeah. Galley slave. We go sailing. Ah, OK. While you're pulling the sails, is it? All right, OK. Right. So we need to raise ?1,000 in order to get this boat shipshape and Bristol fashion. That's it. Well, ready to rummage? Yep. Yes. We certainly are. Follow me. fit for its new lady crew member. But luckily, I don't think we'll be short of items to rummage through in this house. And we've brought along our very own expert to get that search under way. and it looks like he's spotted our first find of the day. Well, what sort of period figures are they? Well, talk about Battle. This is a man in full battle dress. I've got a pair of what look like French officers. At the bottom here, it says "32nd Demi Brigade". Now the phrase "demi brigade"
was used just after the French Revolution, because the name "regiment"
was regarded as too sort of feudal. All right. So they changed everything to demi brigade. But by the beginning of the 19th century, Napoleon changed it all back to regiment. probably depicting that sort of time just after the French Revolution, so late 18th century. turn of the century, bronze-cast figures. Now, when it comes to bronze, it's all down to the detail. But have a look at this figure here and look at the quality of his face. The facial expression, the helmet, the moustache. It's wonderful. They really are beautiful figures. because we've got a bit of damage. Here it's snapped and that's very unusual for bronze because bronze just tends to bend. But that's really been snapped off. But I can see why, because it's so fine there. Mm. or repair here to the sabre or officer's sword here. It pains me because we've got that damage. Yeah. Because without the damage, you could be looking at a lot of money. because the market needs items that are in mint condition. and it's a little bit difficult, as it's the bayonet and the sabre sword. But don't really worry. We can certainly put them to the auction sale and we'll get a really nice, tidy sum. Of? Blimey. Wow. Does that surprise you, Jackie? That is surprising, yeah, cos I didn't know what material they were made from. I wasn't sure if they were bronze. I knew they were extremely heavy. No, I think it was a great find. That's a toilet seat. It is! I'll spend a penny there. OK, well, let's hope they sell at the auction. In the meantime, let's see what else we can find. Come on then. if we're going to get the sailing boat a loo to be proud of. So it's all hands on deck for the rummage. which Jackie's dad bought at auction. Jonty hopes they'll set the saleroom alight with their ?45-?65 estimate. And upstairs, Jackie spots this duchess dressing table, which used to belong to her mother. It gets packed off to auction with a ?60-?80 price tag. the surface of Jackie's collectables and in the dining room something sparkly has caught my eye. Jonty. We've got a lovely tankard here. It seems to be hallmarked. Oh, really? I don't know what that signifies. Now isn't that beautiful? Now that's very sophisticated. Most tankards that you will see will be pewter. Yes. Sometimes a solid-silver tankard, but most will be pewter. But it's great to see something that's hallmarked like that. And if you look closely here, there's a little head. You see that? That's a queen's head. That gives you some sort of idea of date. These hallmarks give a clear indication of date. Amazing that the glass has survived, really. But, for me, I'm a big fan of that. So can we sell this? You say that it's a family piece. Yes. We can? Yes. So what do you think it's worth? What do you think it's worth? I don't know. Shall I say 80, maybe? OK. Now you've told me the history of it. Yes, yes, ?80? That sort of ball park? Lorne? I would say the same. it's also got that simple look which people are looking for today. What a lovely present for somebody. and he's keeping his valuation a secret until the auction. as with a hefty ?1,000 target, every item counts. to find out more about this beautiful house from Jackie. Look what I found here, the deeds to the house. Mm. So this is a really interesting property, isn't it? Mm. I mean, where does it date back to? Erm, about 1500s. It was two cottages. This is one part of one cottage and there was another part. My dad joined them together properly. Ah, OK. So why are you selling it now? in together, so selling the house and moving to a smaller one. So how did you and Simon meet? who I didn't know, but were his friends from college years and years ago. They took me on a kind of blind date and we met in the local pub. So tell me a little bit about the sailing. Were you into that before you met him? No, never, no. I've learnt to like it. It's beautiful. I've always loved the sea and to go out is beautiful and just sail away and you can forget everything. And I'm learning all the time. I think we'd better find Jonty, see what he's got. Shall we? Yeah. so we'd better get on with today's search and raise that much-needed ?1,000. an interesting-looking piece of furniture. Ah, what have you found, Simon. Chair, yes? I found this tucked away. Can I bring it out and have a closer look? Now, do you know anything about this at all? a long time ago and when the mum and dad moved down here, they brought it with them. Well, what we're looking at here, the frame is a mahogany frame. Yes. And you've got the cane back, sides and, once upon a time, you'd have had a cane seat. is what's known as a bergere chair or library chair. highly fashionable in the early part of the 19th century. So you're looking at a Regency style of chair. And you can tell that by these pillared supports on the front, the legs and the reeded effect. It's almost like a stylised column... Yeah, I see that, yeah. ..which was very fashionable at the time. and back, but essentially the caning would still be there. So you wouldn't have upholstery, you would have this stylish caning. it would be worth, retail, between ?2,000 and ?3,000, maybe more. Really? OK. But don't get excited. Because this is a copy. Yeah. And, of course, you've got to build in the fact that this seat has to be replaced. Yes. the way the hammer falls, OK? And when the hammer falls, I reckon that we're looking between ?100 and ?150. Really? OK. So I've built up your hopes. Maybe they'll come crashing down. No, but... But we have to be realistic. Yes, yeah. And I still think one day, once it's restored, it will be a fine chair again. All right? That's nice, yeah. OK. So you take the ply board. Oh, take that. Make good use of it. We'll take the chair to auction. Excellent. All right? OK. Come on, let's go. Right. Even without restoration, that's a sizeable addition to our target. One item in mint condition is this colourful set of wine glasses, which Jackie inherited from her aunt. as Jonty estimates their value at ?60-?80. when she finds this lovely Coalport tea service, which used to belong to her grandparents. and Jonty gives a very festive ?80-?120. Well, our search is going well, but Jonty still has plenty of treasures to rummage through in Jackie's home. So I'll leave him to it and catch up with our nautical couple. but that's something you've come on board to later. How long have you been sailing for, Simon? and moved into the larger boats back in '97. So...11 years I've been doing it now. We've had a few close... Have you? You know, you've got to be on watch and sensible with it all the time. And now you get all these electronic aids. When I first started sailing, I had a compass and that was about it. And I had one particular occasion when I did have a lot of trouble. with the help of the French coastguards. I went out and the first thing I did was buy a GPS, so I knew what part of the English Channel I was in. With a compass, unless you can sight on something, you don't know where you are. but it seems to me that you haven't even provided the basics of life so far. What, like the loo? Yes. Well, I guess none of these things are cheap. We think it's going to cost about ?1,000 to... Just for that. It's amazing, isn't it? Cos it's all the cutting and shaping and all that kind of thing. So it's quite a tricky thing to have done. before they can stick the new lining on, so it's quite a tricky job. Well, Jonty Hearnden's going to have a tricky job if he doesn't find some more stuff to sell! Cos I really want you getting that loo on that boat. Let's see what he's found. It sounds like Simon's boat is in need of a few home comforts. So we'd better get back on with the search for items we can sell. with a rather familiar landmark. Have a look at this picture with me. It's intriguing. Now tell me more. Erm, obviously Big Ben. Yes. Erm, it's been in my parents' house ever since I can remember. As a nipper, it was in the house. But it's Big Ben with a difference. Big Ben with a difference. It chimes Home Sweet Home. All right. On the hour. And you've got two winding mechanisms, one for the movement and one for the chiming. We don't have it working now, because it strikes every quarter of an hour. And that was enough? And that was enough, yes. But it's in the moonlight as well. Yes. Because we have the moon here, but in the form of mother-of-pearl. of the clock tower, the sails and also on the water there. Yes. So it has that atmospheric sort of feel to it. And if you look at the framing, this is very un-British. So this is where it came from. The frame is continental. But you don't get more British than the scene of the Houses of Parliament and the clock tower. Now, values? What's it worth? pictures like this, novelty items like this, set the market alight. People would pay lots of money. But because we're not looking at real genuine quality here. This is a mass-produced, fun wall-hanging, effectively. So we're looking at ?80-?120, that sort of ball park. Oh. Are you happy about that? Yes. Yes? Yeah. That's good. Somebody else can enjoy it. Somebody else can wind it, too. Yes, definitely. Lovely, thank you. I quite agree, Jackie. Our sailor-to-be is really getting into this de-cluttering. Simon is hard at work today as well, as he finds this etched glass tankard. like the other one we found earlier, but Jonty still estimates it at a very saleable ?70-?90. which used to belong to Jackie's dad. Jonty thinks they could bag us a first-class ?70-?100 at auction. she might have another item that could get Jonty's pulse racing. Aw, I say, let's have a look at that. Reveal all. Can we take the cover off? Yeah. OK, so what we're looking at here, looks likely to be a card table. Obviously, hidden up in your attic space here. Now, where did it come from? My grandparents gave it to me. Did they? Yes. I used to play cribbage with my granddad. Did you? Yeah. Did you beat him? Er, sometimes. I think perhaps he used to let me win. So I'm sure you know how it works. The top hinges up, like so. Then we've got the baize on the inside, like that. And these rounded corners really were designed originally for counters. Oh. That's essentially what you're looking at here. really comfortably, four people to sit round. Let me just close it up because I want to show you how it should open up at the back. for the top, like so. and there's a lovely symmetry still to it, open as well as closed. As far as the value of this table's concerned, you're looking at really ?120, ?180. Oh! All right? Yes. So it's still definitely worth selling in the auction sale. Are you happy about that? Yes, yes, definitely. ?120. It's a fantastic find. Great work, Jackie. As our day of rummaging draws to an end, there's one last item to be added to our auction haul. Now what do you know about this? Has it got a name? I think it's called a Wellington chest, after the Duke of Wellington. You're absolutely right to call it a Wellington chest, because that's what they're known as. which is this bar that comes across, like so, with one lock you can lock all six drawers at the same time. And if you look, as a consequence, it's matched up with this same pillar on the other side. So closed it has a very beautiful symmetrical form to it. "It's all wrong." And I don't know if you know what I'm talking about. I think it's the feet. Yes, it is! It is. They're so wrong. They're so wrong for this particular piece of furniture. is just a single, flat piece of mahogany, so a plinth. mahogany that has no mouldings on it at all. It's just square cut. So as a consequence, that's not really a big issue down there. So a restorer can put all that back together again. And what sort of value are we talking about? like the piece of furniture - ?300-?500. Unbelievable. I just... Incredible, that is. Half the load, yeah, definitely. Now, well. You wanted ?1,000, didn't you? For these boat repairs, or should I say, more precisely, the loo? And let's be honest, that's desperately needed. So how do you feel about the valuations today? Well, with that and some of the other prices, we might be quite a bit nearer, don't you think? Yeah, you're not doing too bad actually. Cos the value of everything adds up to ?1,235! Oh! Yeah, what else do you want done on the boat? You won't be getting a loo, you'll be getting a throne! and have a pretty impressive collection of items heading off to auction. We've got the pair of impressive bronze figures, valued at ?250-?300. The elegant mahogany card table with an estimate of ?120-?180. which Jonty valued at ?300-?500. whether Jackie and I were right with our ?80 guesstimation on the tankard. our sea-loving couple have to ride out some stormy weather. Oh, dear. No stamp collectors in today. You can't win 'em all. No. Jonty wonders if he's to blame. Isn't there, Jonty? Yes, it's a bit like me. Bad legs. But some of our items sail to victory. So that's double the top-end estimate. Great. That's really good going, isn't it? I can't believe it. Isn't it wonderful? Yeah. So how will we have fared when the final hammer falls? where Jackie and Simon's antiques will go under the hammer. They're hoping to raise ?1,000 to put towards a new toilet for Simon's boat. 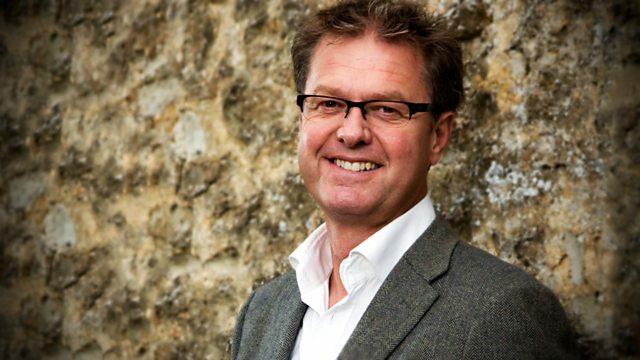 And with our Jonty Hearnden on hand to help, let's hope we don't have choppy seas in the saleroom. Hello. Lovely piece, isn't it? I've just been admiring it. Very tactile. I know. I still don't like the legs. How much of a problem is that going to be? It's not going to go top end. No. It's not too much of a problem at all. A dealer will spot that. They know they can put this into a restorer's and, once it's come out, it would look fantastic. So we're very hopeful about this. Yeah. What else have we got that you're interested in seeing how it does? the French figures? Yeah. They're really good quality. I think they would march out of the auction room. The interesting thing... In auctions now you see bronzes coming up, but not all of them have age, have they? so you've got to be very, very wary. Look for the quality of the detail. OK. So what about the tankard? Are you going to let me in on the valuation? Absolutely not, no. In that case, I want to find the family so that you will let me in. I will. I promise, I promise. 'He may be trying to keep an air of mystery, but hopefully he'll have to reveal all soon. Ah, good morning. Hi, guys. How are you? Nice to see you. So how's the boat getting on? Very well thank you. Yeah, we've been out sailing the other week, didn't we? And it's looking good. But no loo on board yet? No. Of your standards anyway. Not quite, no. We've got a good bucket, though. All that might change. Now I notice you're looking at that beautiful tankard. Yes. We've been talking about it. Wondering what it's worth. because I think it's a very beautiful object. Are you looking forward to today, though? We are now! THEY LAUGH Yes, there's nothing like that to lift your day. Well, we've got some fabulous items to sell today, really good quality, so I'm sure we'll do very well. So pop that down because we've got our places to take in the auction sale. Follow me, guys. Come on then. I am keeping everything crossed that we have a successful day. and we take our places in time for our first lot. which Jonty values at ?45-?65. 96A is our two metal insurance plaques. Little bit of interest in this lot. I'm bid ?30 with me. Straight off at 30. Good. 50. 55. And then I've got 57. Do you want 60? ?60. In the corner then at ?60. 65 there now. 110. 110 then. In the pink at ?110. Anybody else at ?110? 110. ?110! Goodness me. Are you pleased with that? Yeah. That's set the auction room on fire. That's amazing! Crikey. I wouldn't have thought they'd be worth anything like that. Isn't that great? Mm. It's smiles all round and I don't think they're due to Jonty's joke. ?110 is a great result for the plaques. Let's see if our next lot can follow suit. Big Ben, 102A. There we go. 50 for the lot. 55, 60. AUCTIONEER: ?60 for that lot. It's cheap for ?60. And five I'll take. For 6, 65. 70. 75. In the doorway now at ?75. I'm going to sell it for 75. He's sold it for 75. Well done. It's gone for 75.
and the saleroom wasn't feeling the same excitement for that lot. and it's the first of our two glass tankards up next. and we're hoping for at least ?70-?90. What shall we start this at? ?30 to start me. Everywhere. 5, 50, 5, 60, 5, 70, 5. Some very strong bidding going on here. 140, 150... I can't believe this. 180. Upstairs at ?180. Anybody else? 180. 180! I'm selling at 180. ?180, that's double the top-end estimate. Great. That's pretty good going, isn't it? I can't believe it. Isn't that wonderful? Yes. Gramps would be really chuffed. as it's our first furniture lot up next. This lot, Simon, is the bergere chair you found in the bedroom. Yeah. Ready to sell it? so let's see what it makes. OK. Fingers crossed. 114A. A turn of the century, mahogany, bergere chair. Bit of interest in it as well. I'm bid ?100 for it. With me at 100. ?100, 110, 120, 130. 240. With Tony at ?240. 240 is the bid then. For 240. ?240! That's double the estimate again. I can't believe it. How about that? Cor, you're having a good day, aren't you? How fantastic. You're not only going to get your loo, you're going to get your cooker, too! ?240 is a fantastic result and even I was speechless. We're having a cracking day at auction so far. Will our colourful wine glasses do just as well? AUCTIONEER: ?40 for the glasses. ?40. Come on. We need to get more than that. ?40. With me at 40. At ?40. Oh, unsold? Didn't make the grade. Put those out, maybe, now! Yes. too disappointed, I hope it doesn't signal the end of our lucky streak. but our second tankard is next under the hammer. can it possibly perform as well as the first one? Now remember, we've sold the other tankard as well. Yes. Which has done incredibly well, so I'm very hopeful we should do even more than that. So, that's going to be very exciting. Here it comes. Bit of interest in this. I can start the bidding at 160. With me at ?160. ?290! I don't believe it. 330. 335, you want? 335. AUCTIONEER: In the room at 335. At 335. 335 it is. 340 I'll take, somebody else. I knew it was nice, but I didn't realise it was going for that sort of money. Wonderful. ?335 for one piece. That is good. That is amazing. Are you all right? Well, your father and your grandfather did you proud, didn't they? Yeah, they did. I can't believe it. That's brilliant. Yeah, amazing. ?335. Pay that for a glass tankard? We've had a great morning in the saleroom and I can't wait to tot up our total so far. Well, what can I say? What a stunning morning at auction for you guys. I'm so pleased for you. I mean, everything was just... Well, superb, wasn't it? Mm. I think even you're surprised, aren't you, Jonty, by some of them? Well, I'm still ceased to be amazed what good quality makes. It's unusual as well. It ticks all the boxes. But over ?300, what a result for you. I know. It's... I'm just amazed. That's all I can say, really. So how do you feel it went? Are you still a bit shell-shocked? Still shell-shocked at the moment, I think. Cos 300-and-something for the mug... The tankard. Well, the total so far comes to ?940. You're joking! We're only halfway through. And, and we've still got things to sell this afternoon. Yes. We've got so much more to come. It's fantastic. You looking forward to this afternoon? Definitely. Can't wait. OK. Well, you've got a little bit of a breather in between, OK? Yeah. It's not time for champagne just yet. This way. I love being the bearer of such good news and I think our couple could definitely do with a sit down. that commission and possibly other charges will be added to your bill. So it's a good idea to check the details with your local saleroom. and there's a new auctioneer on the rostrum. as the pretty card table is up first. Now, I've estimated this around the sort of ?120 mark, OK? So let's see how we go. The George I, mahogany, fold-over card table. ?100 for it? ?100 for it. I'm bid ?100. Take 110 for a good table. ?110. 140 you've bid. Half price at 140. 150 for it? I'm selling at 140 only. 140 and going then. Your bid. ?140. That's not bad, is it? OK. 140 in the coffers. That was the table that had all the marks on the top as well. Had it not had that, do you think it would have made more? Yes. I think we would have exceeded ?200, but everything's priced accordingly. and a strong start to this half of the sale. which Jonty estimated at ?80-?120. ?50 for it. ?50 for it. Thank you. A bid at ?50. Say 55. 55. Looking down. ?90. 95, new bidder. 100. 110, 120, 130, 140. Thanks for the bid. ?130. 130, are we done? 130. I have to say, that there's a lot of dinner and tea sets here today. A lot of them. And this is the one that's really sold well. So I think you've done very well from that. It's good. It's very interesting, there were two dealers there fighting for that, so we got up to that figure. Spot-on with the valuation. It's good, good. Ah, well, he does his best. Don't you, Jonty? I try my best. You've done it before. and I think our expert has two new fans today. when our next lot comes under the hammer. which are one of our most highly-valued lots. plenty of bidders ready to battle it out for these two figures. They are excellent quality, aren't they, Jonty? Very, very good quality. Remember, we have just a bit of damage which might affect where the market goes. Simon, what do you think about these? Must admit, I'll be glad to see them go, actually. They're not my sort of figurine, really. But, no, make a nice bit of space, there. Yeah. Not even a doorstop? Not even a doorstop for me, I'm afraid, no. Two late 19th-century, bronze statues. ?200. I'm bid at ?200. Give me 210. At ?200, give me 210. 210. 220. There's no money. At 260. Thank you. 270. AUCTIONEER: 280, 290, 300, 310... Come on. Bid's there at ?400. Take 20. At ?400. And going, then. Last chance. At ?400, then. ?400! I bet you like them a bit more now, don't you, Simon, eh? I do, yeah! ?400. That's amazing, isn't it? Yeah. Expensive doorstopper. It would've been, wouldn't it? Yes. but the bronze figures gave a gold medal-winning performance. I can't wait to see how the rest of Jackie's items do today. Right, our next lot is the Victorian dressing table. I had one of these. You can't really store much in them, can you? No, it's only got a tiny drawer. But they look lovely. Let's see what we get. 303A. Now the Victorian dressing table, number 303A. Duchess table, what's it worth? ?50 for it. AUCTIONEER: Low start. ?50. ?40 for it. It's worth ?40 surely? ?40 I'm bid. Thank you. I'm bid at ?40. Encouraging. At ?40. Want 42. Bid's here at ?70. Take 75. Are you out at ?70? Selling at ?70, the duchess. but ?70 for the dressing table is still a solid result. I hope the saleroom recreates some of its earlier excitement of our final two lots today. as his collection of stamps is up next. Jonty estimated their value at ?70-?100. ?80 for the lot? No bids of ?80. I'm going to pass them up. AUCTIONEER: No bids of ?80 then? No-one wants these. No-one likes this one? No. No bids. No bids. No stamp collectors in today. You can't win 'em all. No. one knock-back clearly hasn't fazed our couple. The auction is nearly over and we've one final item to go under the hammer. it's a really important lot for us today. that lovely Wellington chest, which is super. But a bit of a problem with it, isn't there, Jonty? Bit like me, bad legs. Now you've put a reserve on this, haven't you? Yes, ?200. OK, you have to take it back for that amount. ?200 for it? Thank you. A bid at ?200. Give me 210. At ?200, the bid there. That's the bid so far. 240, 250, 240 bid. ?240. Take 50. ?240. Are we done? 300. And 10. 320, 330. At ?320. Take 30. At ?320. 650... Yes, or no, please. At ?620, bid there. At ?620. Do you want 650? It's against you. It's your last chance. 650. Sure this time? 720, I'm bid. At ?720. You're out this time? Saying no. At ?720. Selling. All done at 720. Well... Oh, my goodness! That's just incredible. I can't believe it. Isn't that wonderful? Yeah. That is brilliant. So what do you think your mum would make of that? She'd be shocked, I know. I just hope... That's been tucked in the corner all this time. I know. 700... It blows away what we were saying as well, when it came to restoration costs and retail prices. All that the new owner will do is put a new plinth on it, it will look superb. and Jackie seems speechless yet again. Our couple have obviously done well. Let's just see how well. will you let me know so that some of your good luck rubs off on the rest of us? Extraordinary. Did you enjoy it? Yes, very much. Yeah? Did you ever think it would go quite like that? No, never. No. I am absolutely, really surprised. Flushed with success. Yes, definitely. Can you remember how much you wanted to raise? Between ?800 and ?1,000. OK. All right. Well, you'll be delighted, I hope, to know that you've made ?2,400. Oh, I can't believe it. That is brilliant. There you go - 2,400. Just amazing. I just... Can we have a his and a hers loo now? It's two weeks since Jackie and Simon doubled their target and made an incredible ?2,400 at auction. And today, they're at the marina in Eastbourne. Piece de resistance, here we go. Thank you. Bit different, innit? Yeah. we not only bought a toilet and fitted that, we've gone a step further and gone for a cooker. we can actually cook some in the oven. So it's far better all round now. With the boat decked out with all mod cons, the couple can finally take to the sea in style. And our new sailor seems pleased. and not even moor up actually in a harbour. We can actually stay out at sea. it's going to make sailing a pleasure. I think probably do a lot more sailing. Jacqui Ormonde-Butler has a beautiful home on the Sussex coast, and it's full of top quality antiques she inherited from her parents. She and her partner Simon love to mess about on the water, but their boat is in dire need of repair. In fact Jacqui refuses to become a crew member until all mod-cons are fitted below deck. So will it be Cash in the Attic to the rescue?